legion paper is one the largest and most prestigious paper manufacturers in the world with mills in over 16 countries and over 3,000 paper options. 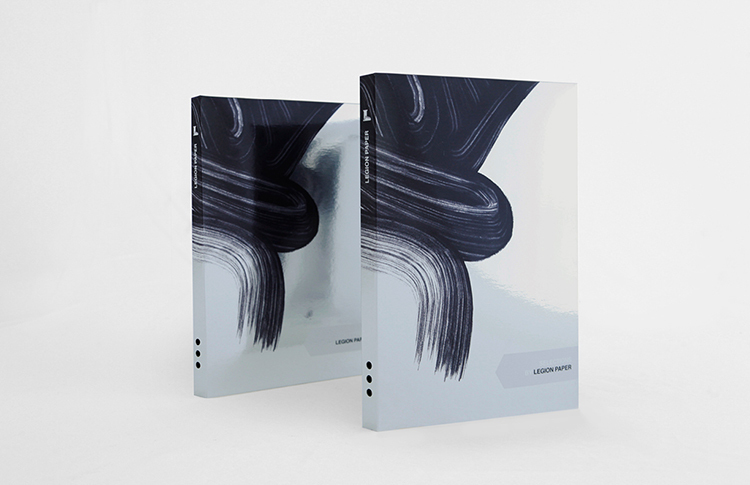 the sample kit designed by ceft and company for legion was ‘engineered’ to allow flexibility and customization. 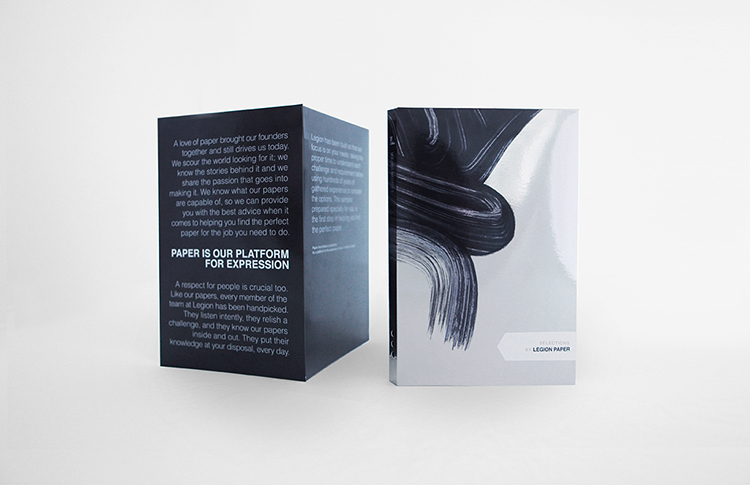 a single folded booklet that can be tailored to any potential clients needs. legion papers designer paper sample kit. 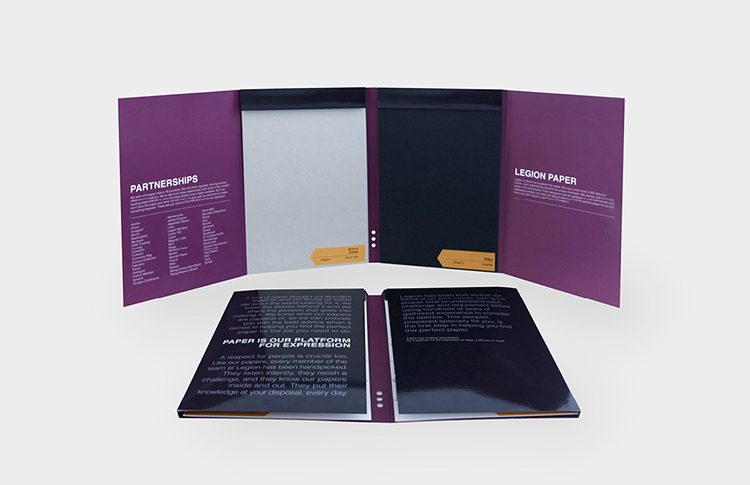 each unit can accommodate a variety of designer papers by using a dual winged upper flap. 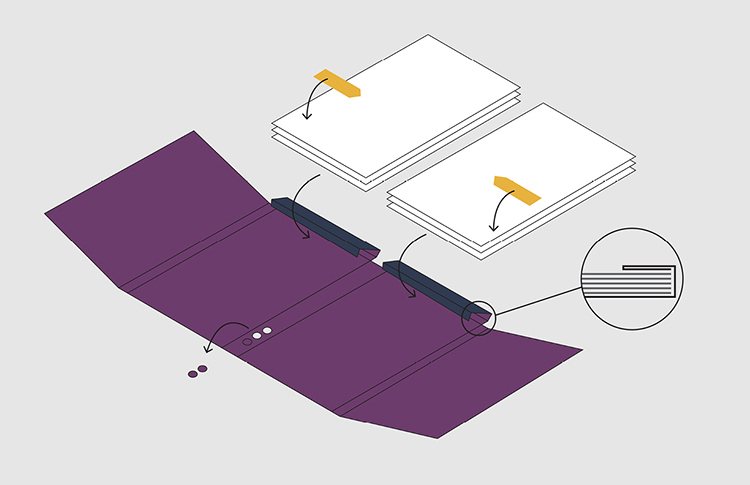 this allows a total of 1/2 inch thickness (1/4+1/4) of selected stocks to be fastened to the two upper flaps. upon delivery, the design allows for users to easily locate the legion books on their shelves amongst other manufacturers. 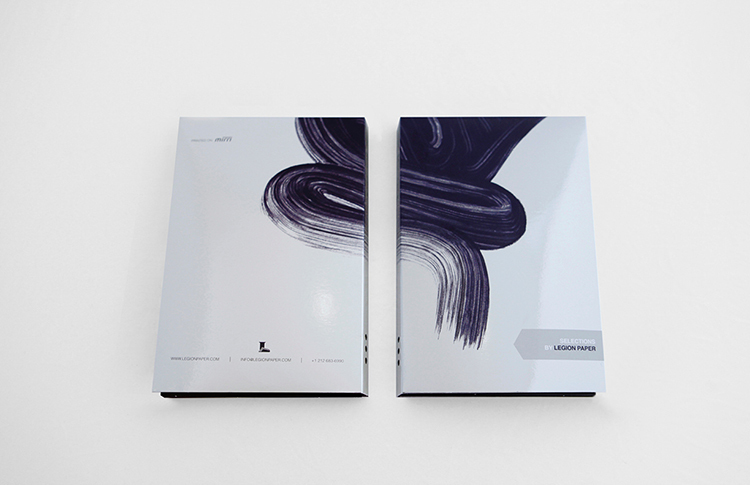 the metallic silver stock (mirri 16 pt cover stock) plays off the reflective surface with a deep black overprinted brush stroke backed by a white base, giving it a bold and unmistakable appearance on any desk. the three punched holes on the spine can be customized by legion or the end user to indicate book sample 1, 2, 3 as well as allowing a sneak peak at the content and color of stock inside when viewed on a shelf. once the winged flaps are extended, much alike a peacock, the book comes to life, revealing a saturated flood of purple on each side. complimentary yellow stickers were created on standard 8.5×11 sheets and calibrated for easy customization at legions headquarters upon a clients order or request. an editable pdf document corresponding to the pre-printed stickers, was created by ceft and company and delivered for clients use. view all work related to this category.